“Whakanuia te Tau Hou Māori ki te Taiopenga o Matariki ki Te Papa. I tēnei tau ka whai tātou i te kōrero mō te whakarauora o Matariki rātou ko āna tamāhine i a Tama-nui-i-te-rā. Ko te mana whakaora tēnei o te ira wahine, o te ira tupua, o ngā whetū o Matariki. Matariki has been celebrated historically throughout many islands of the Pacific as well as here in Aotearoa. Throughout Aotearoa and at Te Papa, Matariki is acknowledged a period of reflection during the quiet time of winter, a time to take stock of preserved stores, and to come together as a people. At Te Papa Tongarewa, Matariki is usually an exciting time filled with events, concerts, and a taonga display selected specifically for Matariki. This year in our taonga display, we profile the hue or the gourd to help us celebrate Matariki 2013. Within Māori cosmology, the hue is personified by the deity Pū-tē-hue or Hine-Pū-tē-Hue. She was the daughter of Hinerauāmoa and Tānemahuta and believed to be a queller of conflict. The hue has associations with healing. It also was extraordinarily versatile as a vessel to carry water and preserve food. The Hue or Lagenaria Siceraria is a remarkable plant; an object admired for its subtle beauty, usefulness and widespread presence across the Pacific, and indeed the world. A widely travelled seed that has followed the migration patterns of humankind across continents and oceans is one of the earliest cultivated plants introduced with the first Māori settlers of Aotearoa. However, it is a plant that has had a wider presence in global migratory stories, with many examples that are able the show material history of the hue across Te Papa’s collection. We have put together a small exhibition celebrating the hue that will be installed closer to Matariki (13 June), where you can see some of the hue from the museum’s collection. That display will be up for a month so come in during the Matariki Festival and explore! 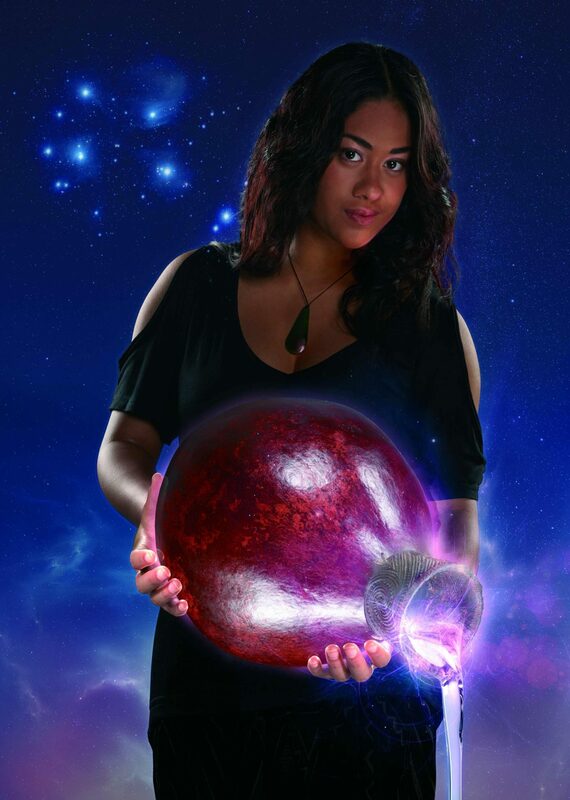 Each year Te Papa also produces a Matariki poster to promote the busy festival programming and activity at the museum. I have been asked a few times about the new Matariki poster, so here is a bit of information. This year, we feature Jasmine Governor, a young Health Sciences student at Whitireia Polytechnic who plans to eventually go into Nursing Training. Jasmine is Ngāti Kahungunu and Ngāti Porou and this was her first modelling foray. I think she did a marvellous job. The tahā or gourd vessel that she holds has been in the museum collection since 1968. It was purchased from the people of Te Whiti Pā, near Gladstone in the Wairarapa circa 1902. So it is at least 110 years old, probably older. Because of conservation concerns about the hue, Jasmine wasn’t able to hold it with her bare hands. So we photographed Jasmine with hands posed as if she was holding it, and then photoshopped in the hue (separately photographed) at a later time. The seven stars which make up the Matariki / Pleiades cluster were also dropped in later, as were the water and light effects. The whole effect was intended to allude to the feminine and healing associations of the hue while also showing a youthful face of Matariki. I didn’t know it at the time but after Jasmine and the hue were selected, I contacted the people to whom the tahā has a direct connection – the people from Te Whiti Pā. After speaking to representative Rawiri Smith who gave the peoples’ endorsement, it turned out that Jasmine is from the same people and has whakapapa to that same pā. So through a lovely Matariki alignment, the hue is held by a descendent of the people who made it. Graphic Designer: Turi Park from Native Limited. Make up / Hair: Natalia Spooner from The Beauty Stop. The story of Matariki and her daughters as told by the Tainui tribes of Aotearoa New Zealand. The story provides the theme for Te Papa’s 2013 Matariki Festival. Well done Jasmine. An excellent job. Don’t forget to save me a copy of the poster. Uncle Gary. This is a beautiful image for Matariki. The colours are superb and the light on the water is very magical as though it is reflecting starlight from the constellation. There are also stars in her eyes, her hair and on her midnight coloured clothing.